For this spooky Halloween edition of StoryWeb, I’m featuring Edgar Allan Poe’s “The Raven.” Everyone knows this haunting poem – but less well known is Poe’s essay “The Philosophy of Composition,” in which he explains how he quite methodically wrote the poem. Now “The Raven,” you have to understand, made a splash. Poe was a relatively unknown writer when he published the poem in January 1845 in the New York Evening Mirror and again the next month in The American Review. Almost overnight, he became a huge literary sensation, though he didn’t make much money from it or his other writing. Readers just couldn’t get over the macabre poem. Poe decided to ride the wave of the poem’s instant popularity, and a year later, he published “The Philosophy of Composition” in Graham’s Magazine. His account of how he wrote “The Raven” step by step is likely exaggerated – he makes it almost seem as if he were completing a paint-by-number artwork. Do this, do that – and voila, a wildly successful poem! 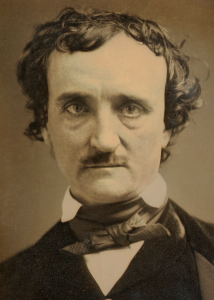 Read the essay to learn why he used certain vowel sounds (such as the long vowel sound in “Nevermore”), how he strove for “unity of effect,” and why he believed stories and poems should be short. If a person could read a poem or story in one sitting, Poe believed, the author could better control the unity of effect. If you want to terrify your reader, best to do it in one concentrated burst with every element of the poem or story contributing to that terror. This question of whether “The Raven” is fine literature goes to Poe’s entire body of work. Perhaps because he was so popular, some scholars call into question whether he can be seen as a serious artist. But to my mind, creating works that are accessible to a wide range of readers is a mark in his favor. Not surprisingly, Poe’s explanation of how he wrote “The Raven” ended up being a footnote to the great poem itself. Few readers know – or even give much thought to – how Poe wrote the poem. They are too busy enjoying it! The “unity of effect” Poe cites in “The Raven” is evident in his fiction as well. Another masterful piece suitable for Halloween is “The Tell-Tale Heart” – and it, too, utilizes unity of effect and is written so that it can be read in one suspenseful sitting. Every single word in this taut, hair-raising story contributes to the suspense, to the reader’s growing horror at what the narrator has done. Both “The Raven” and “The Tell-Tale Heart” are classic Poe. You might want to stop by the Poe Museum. A great volume to have in your collection is Complete Stories and Poems of Edgar Allan Poe . If you still haven’t had enough Poe, check out Poe Illustrated , a collection of more than 100 images inspired by Poe’s work. A fun edition of “The Raven” is Christopher Wormell’s pop-up book , and there’s no end of Raven items you can buy: mugs , posters , T-shirts , and clocks . You can even buy an Edgar Allan Poe action figure ! Treat yourself to some Poe-style unity of effect – and get a good case of goosebumps going with “The Raven”! Listen:Listen as I read Edgar Allan Poe’s poem “The Raven” in its entirety – and follow along with the poem here. You might also enjoy Vincent Price’s version of the legendary poem. Love these comments! Thanks, Dale, Jesse, and Eli! Poe is one of my favorite authors and one of my most treasured possessions is “The Complete Tales and Poems…”. I even have the action figure! Thank you so much for sharing what you did. Unity of effect really casts stories such as “The Masque of the Red Death” in a completely new light.